A beautiful tree of rounded habit, the Golden Chain tree will grow to a rounded shape of about 5 x 4 metres in 20 years. Long racemes of magnificent bright yellow, highly scented flowers hang from branches in May and June, often lasting for two to three weeks, and are very popular with wildlife such as bees. This beautiful variety of tree is sometimes used to create a laburnum walk (an arch of Laburnums held up on a trellis structure). Foliage is pinnate and light-green giving a bright backdrop for the luminous flowers. A tough, very hardy small garden tree Voss’s laburnum (which is the most popular hybrid of the common Laburnum (Laburnum gyroides) was bred in Holland in the 1880's and has the RHS Award of Garden Merit. This variety will tolerate cold, inland exposure and chalk when given a sunny position on well drained soil. Note: every part of this tree is toxic to humans and animals when ingested, especially the seed pods. We recommend avoiding planting it where the pods could fall into a pond and potentially affect wildlife in the water, however the flowers are very beneficial to bees and other insects. Our pot grown Laburnum 'Vossii' can be planted at any time of the year. Firstly, remove all weeds and grass within a metre of your desired planting hole. Dig a hole as deep as your root mass and approximately 2x as wide. To help the tree establish more effectively, sprinkle root grow in the hole. Remove the pot, gently loosen the roots and place into the planting hole. Mix 50% of the original soil with 50% compost, fill in the hole and firm around gently, avoiding banking any of the soil up around the collar of the tree. We recommend planting Golden Chain trees with a staking kit. For single stakes, knock the stake in at an angle and use a buckle tie with a spacer to prevent chaffing. For more advice, visit the help section. If you’re planting Golden Chain trees in spring or summer, water well and regularly for the first few months. Increase watering if there are extended periods of hot or dry weather. If planting in autumn, you may only need to water a little. Note it is quite common for Laburnum trees to flower well one year and then not so well the next, and then back to a good year again. 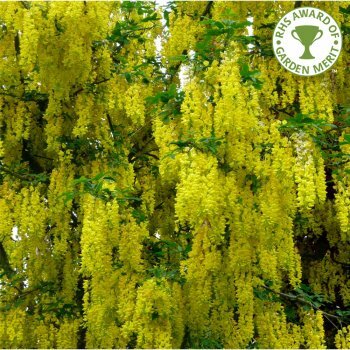 Laburnum 'Vossii' trees do not require regular pruning, but if you wish to tidy them up then do so during the dormant season. Focus on removing any damaged, diseased or overcrowded branches. Despite being low maintenance, Golden Chain trees take pruning well if desired. If you want a clear trunk, remove any side shoots to help raise the crown. They can also be pruned into an arch shape - there's a famous long trellis of arching Laburnums (called a Laburnum Walk) at Hampton Court Palace, with other fine examples at Bodnant Gardens and what was the home of the garden designer Rosemary Verey.